summer is finally here, and i’m so excited about it! i love having my kids home with me, but admittedly, i do find it hard some days to keep them entertained! this year i made a file folder calendar for each of my kids to give them at least one thing to do and look forward to every day. 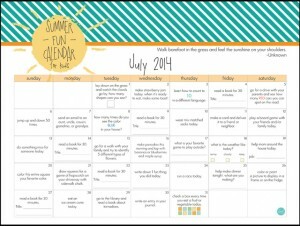 we called it the “summer fun calendar” and it includes activities for every day starting in june and ending in august (not that summer break is 3 months long, but every place is so different with when they start/end their summer break, we thought we’d try and cover all bases!). and the best part is that all of the components are available for FREE DOWNLOAD! 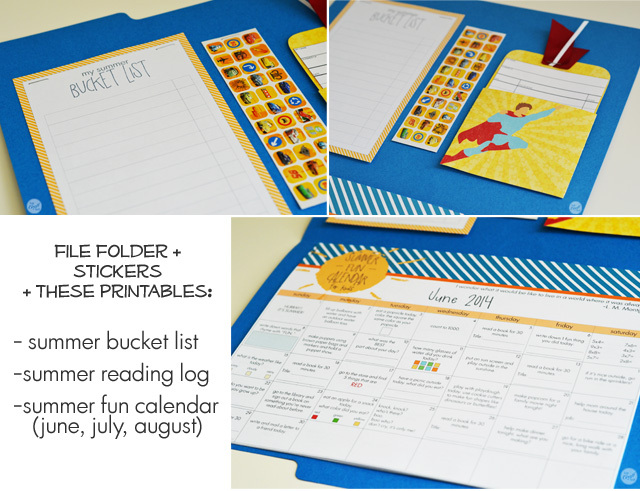 keep reading to find out how to put this easy fun folder together and gather your printables at the end of the post. first, let’s start with the calendars. there are 3 months available. 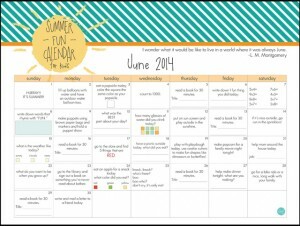 even if you come across this post well into the summer, it’s okay – the activities on each day are simple enough that you could easily do multiple activities per day until you’ve caught up! once you’ve downloaded and printed the calendars (all of the printables are available at the bottom of this post), you may need to trim slightly, depending on your file folder. i had to trim less than a 1/4″ off each edge, but there is plenty of room to do that without trimming off anything important. stack all three calendars together in order and staple to the inside bottom of your file folder at the top 2 corners. as each month passes, you can simply rip off the finished month. next, the bucket list and reading log. everyone has a summer bucket list. this one has a space to put a check mark or small sticker to show how many things they accomplished this summer. 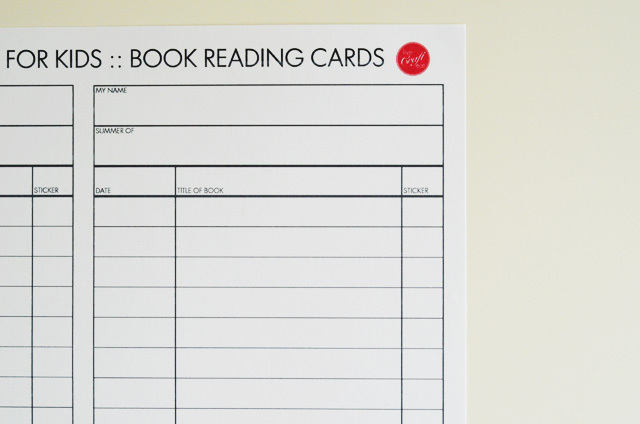 the reading log looks like one of those old library cards, and we even made our own library card pocket using a free template i posted in a previous post (<- click on that link to be taken to the post with the free printable template), and adjusted it to fit the card. everything was stapled to the top half of the file folder. here’s a close up of the reading log cards. there’s a space for their name, the year, the date they started and book and the title, and then a space to put one of those little stickers to show that they read the entire book! there are 4 cards on a sheet, so they can get lots of reading done this summer! see how easy it was to put together? 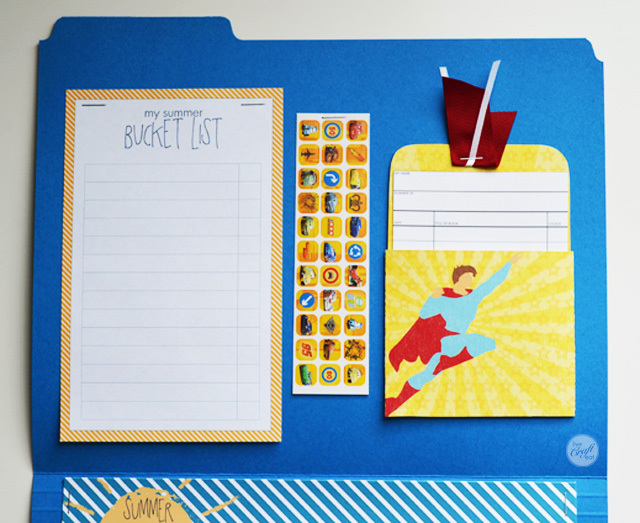 a simple file folder, some small stickers, and all of these fun, free printables! 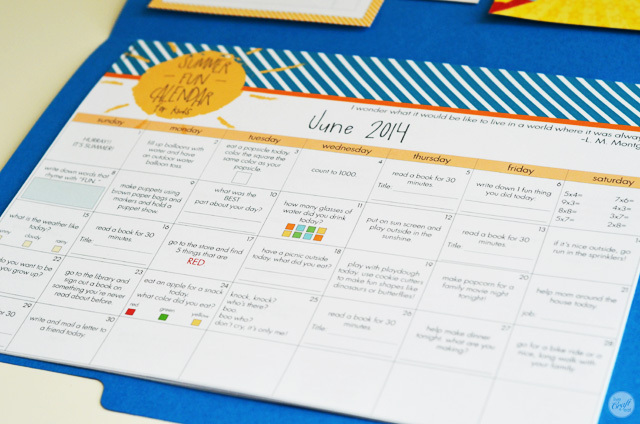 ready for your free printables?! here they are! simply click on the image to download a PDF version of everything you need to to print to make this quick and easy (and perfectly portable…traveling, anyone?!) file folder for kids! hope you enjoy your summer!! 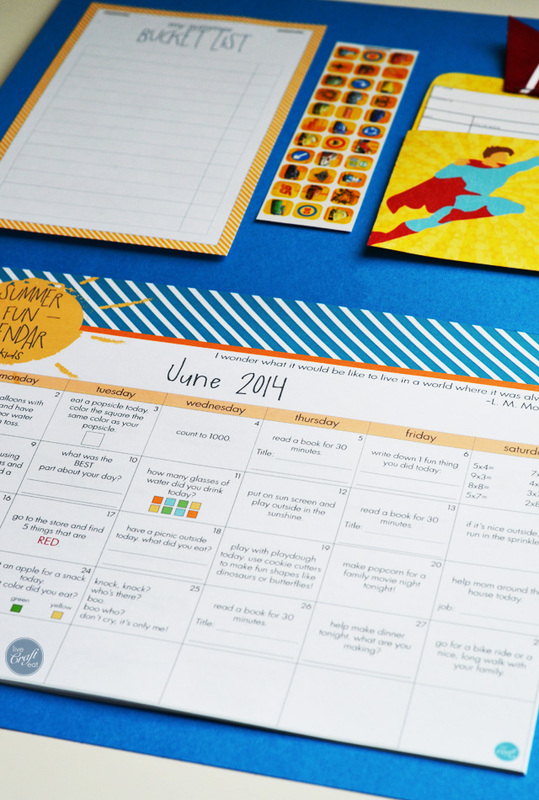 by the way, you can find all of my printable calendars (for kids and mom!) over at the live craft eat calendars page. <-just click on that link! this is wonderful! I do a 3 month calendar for my preschoolers’ parents when I do end-of-year home visits, however its just a B/W copy. 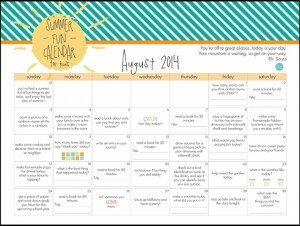 this will be a fantastic way to spruce it up and encourage parents to keep their kiddos learning all summer long! Thanks for sharing (AND for the free downloads!). I LOVE this idea! 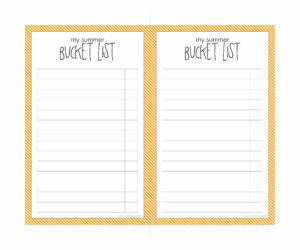 Just one question….What’s the easiest way to get a full sized bucket list, the one I printed in half a page & yours looks larger. Thanks!! Hi Ali! The bucket list comes in 2/(8.5″x11″)page format…if you put everything in a file folder like I did, that’s all you’ll have room for. If you need a different size, message me and I’ll see what I can do! Thanks! This is a awesome calendar. I was planning to use a plain version until I saw this. Do you have a 2015 version of this calendar. I would love to give it to a group of 1st and 2nd grade targeted learning students i work with.